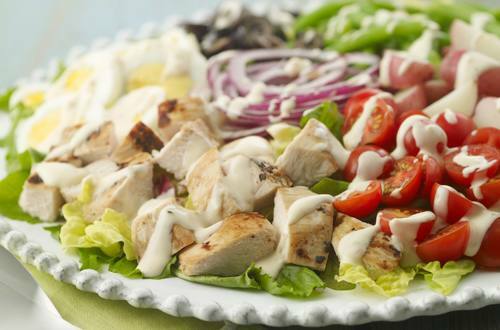 1 Combine Hellmann's® or Best Foods® Real Mayonnaise with dressing in small bowl. Reserve 2 tablespoons; set aside. 2 Grill or broil chicken, turning once and brushing with reserved mayonnaise mixture, 12 minutes or until chicken is thoroughly cooked. Cool, then cut into cubes. 3 Arrange greens on large serving platter, then top with chicken, green beans, potatoes, onion, tomatoes and eggs. Just before serving, toss with dressing.